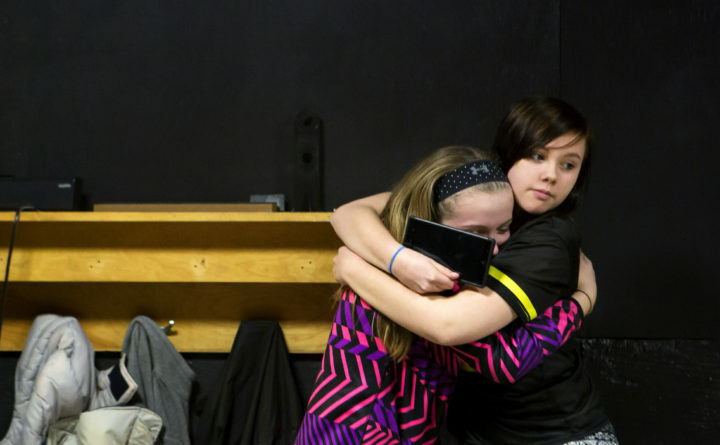 Hailey LeClair hugs a friend at Inside Out youth group at the United Baptist Church in Old Town on March 16, 2017. A social services group based in Bangor will bring more than a dozen local organizations together to address the needs of children harmed by the opioid crisis, after winning a first-of-its-kind federal grant for the region. On Monday, Penquis announced it won $632,037 from the U.S. Department of Justice. Starting immediately, and continuing over three years, the money will be used to address a number of gaps in services for children in Penobscot and Piscataquis counties who may have experienced the neglect of a loved one actively using opioids, the devastation of losing parents to overdose or arrest, or having to find a new home because their guardians could no longer care for them. Between 1999 and 2016, opioid overdoses most often claimed the lives of Maine people in their childbearing years. Parents’ substance use is a top reason why children end up in state custody. And in about the last decade, more than 7,700 babies were born drug-affected in Maine. Yet, despite the fact that childhood trauma can substantially affect development and is a strong predictor of depression and suicide, there are few formal avenues for children to find their own support and healing. “I think the needs are many,” said Kara Hay, chief executive officer of Penquis. The organization will involve other community groups, businesses, faith groups, the public and, in particular, youth themselves, in figuring out how exactly to proceed. “I really, really want our youth to tell us what those needs are,” Hay said. Some possibilities could be: counseling and support groups; preschool interventions, such as play therapy; training for treatment providers; access to basic supplies such as a cell phone, easy-to-prepare food, clothing, transportation, and a place to go if a parent can’t care for a child; mentoring and tutoring; age-appropriate education about how to rescue someone who has overdosed; and social options for kids, such as summer camp, sports, theater club, art classes and music lessons. In 2017 the Bangor Daily News profiled a teenager from Bradley whose mother had been arrested for selling drugs. Hailey LeClair shared the shock, anger and all-consuming thoughts that came with not having a mother she could depend on. Yet what she felt was more complex: She understood addiction is a disease; she still loved her mother; and even though she knew she shouldn’t, sometimes she felt like it was her fault. More than anything, she wanted to be understood.